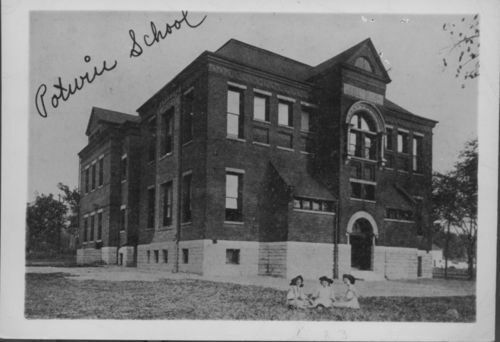 Viewing the exterior of Potwin School after a 1904 addition in which four classrooms were added to the school. The two story red brick building with Colorado sanstone trim was located at Elmwood and Park Avenue. The young ladies infront of the school are identified left to right as: Helen Knox, Alice Hughes, and Metta Calkins.